Bharat Sanchar Nigam Limited (BSNL) Rajasthan Telecom Circle has announced Four new cheapest call rate STVs under 2G and 3G Mobile services. The Rajasthan BSNL Telecom Circle Competent Authority has decided to launch Special Tariff Vouchers (STVs) of Rs.32/-, Rs.79, Rs.89/-, Rs.209/- for Local and STD calls to any network. Under STV-32 and STV-89 BSNL Customers can make Local calls on any network at 1ps/2sec and STD calls on any network at 2ps/3sec with validity of 30days for STV-32 and 90days for STV-89. Under STV-79 and STV-209 BSNL Customers can make Local calls on BSNL Network at 20ps/min and to Other network calls at 30ps/min. STD calls will be charged @40ps/min with validity of 30days for STV-79 and 90days for STV-209. 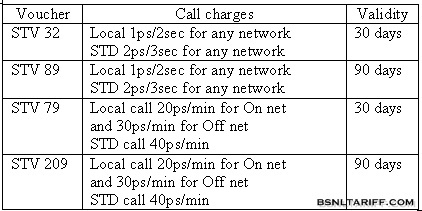 The above STVs valid only for BSNL Customers of Rajasthan Telecom Circle (Subject to change in the value of STV sale value in other Telecom Circles). There is no certain provision or code for deactivation of STVs. After activation you've to wait till the end of validity. If you don't want continue further then leave it, activation plan option will be automatically deactivated.